EL CAJON (2-9-2019) – Senior JACKSON LARSEN was excited on Saturday morning while being interviewed about his basketball career at Christian High. What a great way to hear the 6-foot-7, 185-pounder discuss his future at Northern Arizona University at 9 o’clock on a Saturday morning. This was the case with the young Patriot hoop star, who announced his verbal commitment on Oct. 14. According to Larsen he had spoken to several schools and had a few verbal offers, however, Northern Arizona University was the first to make the substantial offer. Jackson had been dubbed the captain this season and after the departure of a few key players and really became the nucleus of the Christian High Patriots. Larsen, who led the team in total points scored in 28 games played, averaging 21 points per game, and averaging 10 rebounds per game, seven of them defensively. When questioned about his three years at Christian High Larsen said: “The whole staff has been great. Academically, they definitely prepared me for college, and athletically, I’ve had the most rapid development over the three years I’ve been here. “Our Athletic Director, Mr. (David) Beezer has been doing a great job of getting us what we need to be successful. Jackson will be majoring in finance. 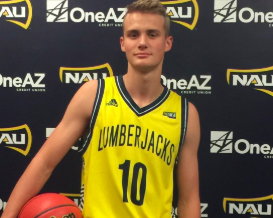 Apparently, two assistant coaches and the head coach of NAU, Jack Murphy,, came down to observe Larsen’s workouts on three different occasions. “When I received the news that I was going to be accepted to NAU, I was at my house with the family. The news came pretty quickly after we returned from our official visit to the campus. Jackson will start his summer workouts in June, however, of course, the school year won’t begin till September at NAU. “I met most of my new team members, and I think we are just going to continue to get better and grow as a team,” said Larsen. Most importantly, according to Jackson, his family couldn’t be happier with his decision and will continue their support, as always.